Editor’s Note: Since we’re only a few weeks away from Halloween, I thought’d I review a few horror movies. I’ll be talking about films like The Shining, Poltergeist, and The Wolf Man after this. Also, this is my 400th post. This is likely to be the most controversial review I will ever write. I know there will be about a million comments telling me what was I thinking. But this is my opinion and I think The Sixth Sense is a film that ranks up with movies like Rocky and Avatar that receive excessive praise. 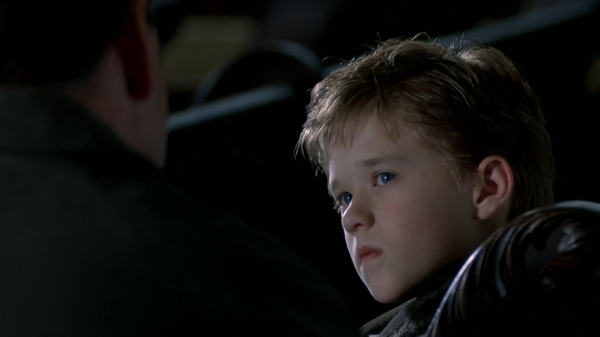 The Sixth Sense is not a dreadful movie, but it’s a bad one that is flooded with many noticeable flaws. I don’t want to offend fans of the movie, so let me just say that I respect your opinion if you do like this. I will admit that there are many parts of the movie are enjoyable. But the movie lacks a sense of coherency to put itself together. Everywhere Sear goes, he sees dead spirits around him, who haunt him. Sear is troubled by these ghosts and is misunderstood by others. His mother (Toni Collette) doesn’t know what’s wrong with him and his fellow students think he’s a nutcase. What most people really like about the movie is the twist ending (don’t worry, I won’t spoil it here). Someone actually did ruin it for me, so I can’t say if I would have guessed it or not, though there are some fairly obvious clues. I will freely admit this is one of M. Night Shyamalan’s better film, though this is the same guy who made The Last Airbender and The Happening. But his direction seems completely off here. After the movie I couldn’t recall a single image from the movie. Moreover, the suspense in the film is meager. The idea of The Sixth Sense bares resemblance to an Alfred Hitchcock film, but Hitchcock knew what could scare an audience and put them on the edge of their seat. Shyamalan doesn’t. Bruce Willis is an actor who could be good given a strong role, not just in action movies like Die Hard but in other genres (he was great in this year’s Moonrise Kingdom). And his role here is better than his others’ in movies like North and Armageddon (though that’s not saying much). But I couldn’t help but feel that Bruce Willis looked so bored throughout the movie. He has the same dull expression on his face during the entire film. The strongest part of the movie is undoubtedly Osment, who is a talented child actor. He is very chilling in his role and adds the very little believability in the movie. Osment was nominated for an Oscar, which I can say was deserved, but even he can’t pull up this movie from falling into mediocrity. What really unnerves me is that The Sixth Sense managed to get a lot of Oscar nominations, which I suspect is due to its popularity. It received a Best Picture nomination. Can I mention that in the same year Being John Malkovich, a far superior film, debuted and wasn’t nominated for Best Picture. Explain that to me Academy. Explain that to me. « What is the best Treehouse of Horror short? One Of THE Most Overrated Flicks EVER. “UNBREAKABLE” Was 10-Times Better, Yet Everyone Totally Dismissed It. If You Watch “The Sixth Sense” Just One Time, You’ll Love It. Watch It More Than Once, And The Joy Diminishes With Each New Viewing. “UNBREAKABLE”, On The Other Hand, Get’s Better And BETTER!!! I totally agree. Unbreakable was a lot better, but no one ever actually ever talks about it (which is a real shame). I think most of the popularity came from the twist ending. Thanks for commenting. I really wanted to like it. I respect other’s opinions about the movie but it just didn’t work for me. Thanks for commenting. I was hoping more from The Sixth Sense and it just didn’t deliver. When I saw it again, I disliked it more than the first time though. Thanks for commenting. I liked the premise but thought the movie could have been better. I’m glad you liked it though. Thanks for commenting.